Orthodontic appliances can be made of metal, ceramic (clear braces), or plastic (invisalign). They may be removable or they may be brackets bonded to the teeth. By placing a constant, gentle force in a carefully controlled direction, braces slowly move teeth to a corrected position. This is a great time to wear braces! Gone are the days when a metal band with a bracket was placed around each tooth. You can choose brackets that are clear or metallic color. You can choose the color of the ties that hold the wire in brackets. Wires are also less noticeable than they used to be and the latest materials move teeth faster with less discomfort to patients. Dr. Becht is a certified Invisalign provider. 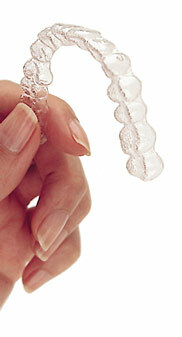 Invisalign treatment consists of a series of clear aligners that are custom fabricated to fit you. The virtually invisible aligners are programmed using a computer simulation to gradually move your teeth to the desired position. All patients are not candidates for Invisalign treatment; Dr. Becht will discuss the treatment options that are right for you at your consultation. Treatment time typically ranges from one to three years, depending on the growth of the patient’s mouth and face and the severity of the problem. Patients grow at different rates and will respond differently to orthodontic treatment, so the time to case completion may differ from the original estimate. The patient’s diligent use of any prescribed rubber bands is an important factor in achieving the most efficient treatment. Interceptive, or early treatment procedures, may take as few as six months. When you get your braces on, you may feel general soreness in your mouth and teeth may be tender to biting pressures for three to five days. This can be relieved by rinsing your mouth with a warm salt water mouthwash. Dissolve one teaspoonful of salt in 8 ounces of warm water and rinse your mouth vigorously. The lips, cheeks, and tongue may also become irritated for one to two weeks as they toughen and become accustomed to the surface of the braces. You can put wax on the braces to reduce discomfort. We’ll show you how! If you play sports, it’s important that you consult us for special precautions. A protective mouthguard is advised for playing contact sports.